A Students’ Union which set out as an independent entity just under two years ago is celebrating being crowned Wales’ best. 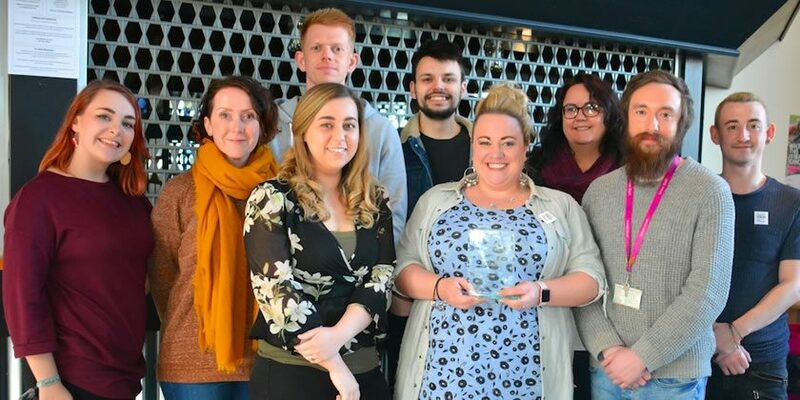 Wrexham Glyndwr Students’ Union was recognised as Wales Higher Education Students’ Union of the Year at a ceremony at the Principality Stadium in Cardiff. The award recognised the work the Union has undertaken since September 2015, when it was a Guild and a department of the University. Since then, the Guild became an independent students’ union, registered as a charity and become a company in its own right. It now employs seven members of staff and two sabbatical officers. Employees at the Union have been reflecting on last week’s win but are not resting on their laurels, with new campaigns already underway and elections taking place this week. Students can let their views be known via the bespoke ‘Tell Glyn’ system, which allows them to tell the Union what they are and are not happy with and any changes they would like to see. Feedback is sent on to appropriate departments and the union also reports issues back to the University’s Learning, Teaching and Quality Committee for discussion and action – and from there to the Academic Board and the Board of Governors for noting. The award was also given for the significant work the Union has done on their strategy; they released their first ever strategic plan which takes them through to 2021. The University tells us the plan was entirely based on feedback from students during a research exercise; as part of this students said that two priority areas for the Students’ Union should be representation and advice. A range of advice and support is available from the Union, with subjects covered from housing and accommodation to academic issues. Top Picture: The Students’ Union team with their award – back row, from left: Codie Wright, Kim Lloyd, Will Medforth, Angus Hamill-Stewart, Cath Clark and Marc Caldecott and front row: Lowri Hiles, Sarah Ellis and Travis Davies.